The State relies heavily on the sale of bonds to fund the capital budget. The original Illinois Jobs Now! capital program passed in 2010 included approximately $16.2 billion of bond-funded expenditures. Increased license and vehicle fees. The proceeds from these sources are deposited in the Capital Projects Fund and used to pay for debt service on new capital bonds and some ongoing capital expenses. This was intended to limit the General Funds impact of the additional debt sold to pay for the new capital budget. However, the taxes and fees have yet to produce the funding projected when Illinois Jobs Now! was originally approved. In FY2017 Capital Projects Fund revenues are projected to total $754.4 million compared to the total of $731.4 million in FY2016. The legislative projections provided when the spending was approved in FY2010 anticipated $943 million to $1.2 billion annually. The following table shows the revenues deposited into the Capital Projects Fund from FY2010 through the estimated FY2016 and projections for FY2017. The original legislative projections are also included in the table for comparison. The largest shortfalls in revenues are related to the gaming sources from leasing the management of the lottery out to a private company and the legalization of video poker in Illinois. Due to administrative delays, the first video poker machines were not put into service until October 2012. Fiscal year 2013 was the first year that the capital budget received revenue from the 30% tax on video gaming. Under the law establishing legalized video poker, five-sixths of the tax revenues generated are used for capital project funding and the remainder is shared with local governments where the machines are in service. The estimated FY2017 video gaming revenue totaling $258.0 million is still below the projection of $288 million to $534 million annually. This is largely due to the ability of local governments to opt out of video gaming or to continue existing local bans on the machines. According to a report from the Commission on Government Forecasting and Accountability, 46.5% of the Illinois population lives in communities where video gaming is illegal. Chicago, where video gaming remains prohibited, represents 21.0% of the State’s population. The lease to manage the State’s lottery is no longer expected to bring in any funding for the capital budget in FY2016 and FY2017 after revenues dropped to only $8 million in FY2015. It was assumed that the contract would earn the State $150 million annually when Illinois Jobs Now! was enacted. After several years of delays in the management bidding process and then disputes over performance requirements, the State has requested the termination of the agreement with its vendor. It is unclear how long it will take the State to exit its existing agreement and choose a new vendor. Although gaming related revenues account for the largest shortfall in capital funding, as shown in the table above, all other sources of capital projects revenue except liquor taxes continue to fall short. In addition to paying for the debt service on the Illinois Jobs Now! bonds, the Capital Projects Fund is statutorily required to make an annual payment of $245.2 million to General Funds. If the revenues generated for the Capital Projects Fund are not adequate to pay for all of these costs, the General Funds and Road Fund are used to cover the shortfall. The Capital Projects Fund must then repay the shortfall in the next fiscal year. This cycle of borrowing and repayment, combined with the inadequate resources in the Capital Projects Fund has led to the growth of an accumulated shortfall passed from one year to the next in the Capital Projects Fund. The Capital Projects Fund will have an accumulated shortfall of $800.7 million in FY2016, which is an increase of $309.6 million from the FY2015 total of $491.1 million. The accumulated shortfall in FY2016 exceeds the total expected revenues of $754.4 million in the Capital Projects Fund for FY2017. 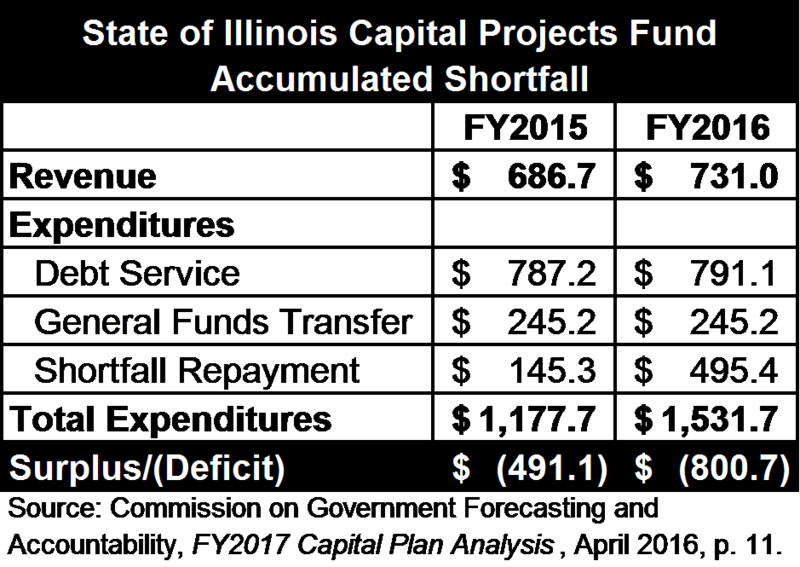 A projection of the FY2017 Capital Projects Fund shortfall is not currently available. However, without additional resources it can be expected to grow until the debt service on the new bonds is significantly paid down. The following table shows the revenues and expenses leading to the shortfalls in the Capital Projects Fund in FY2015 and FY2016. Because the projected shortfall in FY2016 exceeds the total revenues for FY2017 in the Capital Projects Fund, the total accumulated shortfall is expected to grow in the coming year even if no additional bonds are issued. However, according to the Governor’s recommended FY2017 the State anticipates selling an additional $1.0 billion in capital purpose GO bonds before the end of FY2016 and $800 million in FY2017 to continue funding its capital budget. For more on the State’s debt burden and capital spending see the Civic Federation’s analysis of the State of Illinois FY2017 Recommended Operating Budget: Analysis and Recommendations. The Commission on Government Forecasting and Accountability provides an annual Capital Plan Analysis. The Governor’s recommended FY2017 Capital Budget and full capital projects list are available here. Illinois State FY2017 Budget, p. 525. Public Act 96-0034, enacted July 13, 2009. Commission on Government Forecasting and Accountability, FY2017 Capital Plan Analysis, April 2016, p. 11. Commission on Government Forecasting and Accountability, Capital Plan Analysis FY2017, April 2016, p. 10. For additional analysis, please see our March 21 blog post .